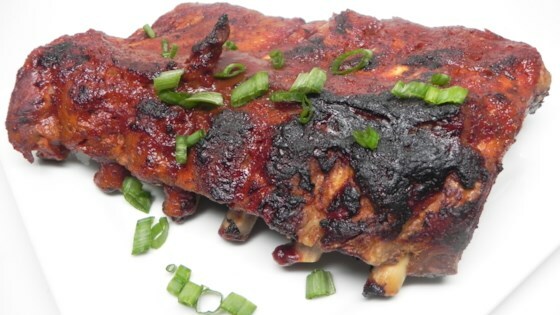 "These baby back ribs made in the Instant Pot® are fall-off-the-bone good!" Combine water, vinegar, and liquid smoke in the pot of a multi-functional pressure cooker (such as Instant Pot(R)). Place rack in the bottom of the pot. Season baby back pork ribs with salt and pepper on both sides. Cut rack in half. Place ribs in a teepee formation onto the rack. Pour a little barbeque sauce onto each half and let run down the sides. Close and lock the lid. Select Meat setting according to manufacturer's instructions; set timer for 30 minutes. Allow 10 to 15 minutes for pressure to build. Wait 15 minutes before releasing pressure carefully using the quick-release method according to manufacturer's instructions, about 5 minutes. Unlock and remove the lid. Set an oven rack about 6 inches from the heat source and preheat the oven's broiler. Line a baking pan with aluminum foil. Place ribs onto the prepared baking pan and slather with barbeque sauce. Cook under the broiler for 5 minutes. Remove and immediately add more sauce. Have lip-smacking, saucy ribs ready just minutes after you get home from work.